In Looking Back and Seeing Now, the local artist sweeps up the viewer in a tornado of tambourines punctuated with the eyes of her ancestors. Not long ago, Berkeley artist Lava Thomas was standing in a cemetery in Los Angeles attending the burial of her best friend's mother. It was the same cemetery at which her grandmother had been buried years before. Afterward, she visited her grandmother's old house; it was exactly how she remembered it being when she was a child. She began to search for sheet music in her grandmother's piano bench, and although she and her family believed they had sifted through everything in the house, she discovered a photo album that she had never seen before. She deduced that the portraits inside were from the late 19th or early 20th century, during a time when her ancestors still lived in the South, but she didn't recognize the faces in them. Yet two African-American women caught her eye. They looked regal and shared a defiant gaze. Thomas didn't know who they were, but she couldn't look away. "I was mesmerized," she said in a recent interview. Those portraits, which Thomas redrew with incredible detail, are the grounding pillars of her new solo show at the Berkeley Art Center (1275 Walnut St.), titled Looking Back and Seeing Now. Dramatically enlarged, the elegant busts preside over an entire gallery wall, facing one another, returning gazes of solidarity. Between them hangs a twinkling, inverted pyramid of dozens of suspended tambourines. The hanging instruments are black with shiny silver or blue lambskin stretched across them. Some have mirrors placed inside them, and others bear blown-up renditions of the commanding eyes of the women on the walls. 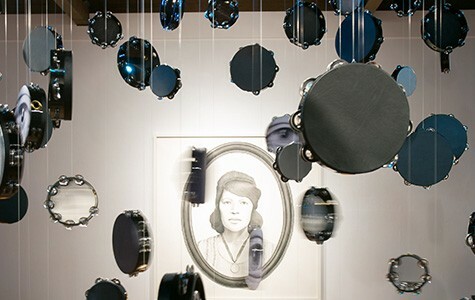 The tambourines gently spin, jostled by fans at the top of the installation, creating a subtle twinkling sound, like raindrops hitting asphalt. For Thomas, the tambourine is a symbol loaded with meaning. As a child, she would play one at her grandmother's church. "It was very ecstatic for me," she said. But she also chose to incorporate the instrument for its broader political and historical significance. "It's a very democratic instrument, you don't have to have any musical knowledge to be able to play it," said Thomas. Tambourines are mentioned in the Old Testament, and they are depicted on ancient Greek urns, she noted. "That really appealed to me, having something that I had a personal relationship with in the past, but something that resonated with so many different people," she said, referring to a duality common in her body of work. 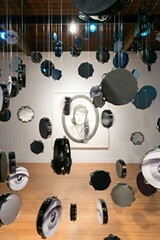 The tornado of tambourines is central to the installation, but Thomas did not intend for it to be the focus. Rather, she aimed to transform the gallery into an immersive artwork, enveloping viewers and incorporating their presence. Carefully positioned blue and white lights are mounted on the trellis supporting the tambourines, casting ghostly circular shadows onto every wall, like a melancholic disco ball. "I wanted the walls of the gallery to be activated by the piece," she said. "I wanted the piece to be alive." Thomas began working on the installation in January 2014, but put it on hold to present a solo exhibition at the Museum of African Diaspora in San Francisco at the end of that year. So, the course of the project was stretched to a year and a half — a time in which Thomas often found herself hearing tragic news regarding race relations in America, and deeply considering its connection to the portraits she was making. She became fixated with the notion of sacrifice (which inspired her choice to use lambskin), wondering what her predecessors went through in order to make her life possible. "Knowing that they were Black women who lived in the turn of the century in the South ... what were their lives like and what must they have seen in their lives?" she said. "But the larger question was, especially listening to the news — yes, a lot has changed — but what is the same?" Despite the sorrowful gazes that punctuate the piece, there is an undeniable lightness to it — a sense of whimsy that signals hope. Thomas is insightful in characterizing the tambourine as ecstatic, offering anyone immediate and unrestrained expression. There's an empowering quality to that. "Something that I try to do in my work is allow for a place of not just contemplation, but transformation, for change, for healing, too," she said.